repeats, a motif of 37 to 43 amino acids, each of which (as first defined for the scaffold (A) subunit of PP2A) contains an antiparallel pair of a-helices; the HEAT hairpin modules assemble in a linear, repetitive fashion to form an elongated stack of double helices . The intrarepeat turns form a continuous ridge, presumably a protein interaction surface. mTOR has 20 HEAT motifs, which occupy nearly all of mTOR AA71-1147. The HEAT domains of yeast TOR have been reported to mediate membrane attachment . The bulk of mTOR in mammalian cells is also particulate, although a precise localization is not available; a portion of mTOR polypeptides appears to be nuclear , and the nuclear entry may be critical for certain signaling functions (e.g., in transcriptional regulation). As first shown by Brunn et al. , mTOR is capable of phosphorylating 4E-BP directly in vitro, preferentially at Thr 37 and 46 and possibly at all sites (Ser 65 and 82, Thr70) that undergo insulin/PI-3K-stimulated phosphoryla-tion in vivo [66,67]. Subsequent work established the ability of mTOR to phosphorylate directly in vitro several functionally relevant sites on the p70 S6K [68,69]. The mTOR-catalyzed phosphorylation of 4E-BP, in vitro and probably in vivo, occurs in a hierarchical fashion, with phosphorylation of the sites (Thr37 and 46) amino-terminal to the 4E binding site (amino acids 54-60) occurring preferentially and those carboxy-terminal to the 4E-BP binding site occurring subsequently. The initial two phosphorylations have little impact on 4E-BP binding to eIF-4E; however, phospho-rylation of the more carboxy-terminal sites, especially Ser65, potently inhibits eIF-4E binding. The phosphorylation at these carboxy-terminal sites also exhibits the greatest sensitivity to dephosphorylation in the presence of rapamycin and inhibitors of PI-3K; it is unclear whether this differential sensitivity is attributable to the properties of the relevant phos-phatases, the dependence of TOR-catalyzed phosphorylation at these more carboxy-terminal sites on the prior phosphorylation at Thr37 and 46, or the operation at these sites of a second, PI-3K-dependent protein kinase [66,67]. The properties of the mTOR-catalyzed in vitro phosphorylation of 4E-BP and p70 S6K differ in several ways. A striking difference is in the mTOR site selection on these two targets; all sites phosphorylated on 4E-BP by mTOR in vitro are Ser/Thr-Pro motifs [65,66]. In contrast, although mTOR catalyzes the phosphorylation at Ser/Thr-Pro sites on p70 S6K, in the SKAIPS domain and elsewhere (e.g., p70 S6K Ser394), the major site of mTOR-catalyzed phosphorylation is Thr412 in the motif FXXFTY [68,69]. Such diversity in site selection is unprecedented, and suggests the operation of a second, mTOR-associated protein kinase. Nevertheless, the mTOR-catalyzed phosphorylation of both p70 S6K and 4E-BP is inhibited in vitro by the addition of a rapamycin/FKBP12 complex, and mTOR mutated in its catalytic domain is unable to catalyze in vitro either phosphorylation. Thus, all these sites are phosphorylated in vitro directly by mTOR . When extracted in a Tween-containing buffer , mTOR catalyzes detectable phosphorylation of both 4E-BP and p70 S6K. If, however, mTOR is extracted into a buffer containing Triton X-100, the ability of mTOR to phos-phorylate 4E-BP in vitro is lost entirely, whereas mTOR-catalyzed phosphorylation of p70 S6K is unaltered or even increased . Recent work [70,71] has established that the detergent-sensitive phosphorylation of 4E-BP by mTOR reflects the detergent-induced loss of an mTOR-associated scaffold protein, whose continued binding to mTOR is necessary for mTOR-catalyzed phosphorylation of 4E-BP in vivo and in vitro. This 150-kDa polypeptide (Raptor) is highly conserved from S. cerevisiae to humans and contains seven WD40 repeats in its carboxy-terminal segment. Raptor binds 4E-BP and p70 S6K as well as mTOR and is absolutely required for mTOR-catalyzed 4E-BP phosphory-lation in vitro; Raptor binds selectively to hypophosphory-lated forms of 4E-BP and physically links mTOR to eIF-4E. Insulin and amino acids promote the dissociation of the mTOR/Raptor complex from eIF-4E, in part by promoting the phosphorylation of 4E-BP . The association of Raptor with mTOR may also be regulated by amino acid . Remarkably, RNAi-induced inhibition of Raptor expression in C. elegans reproduces every phenotype seen with CeTOR deficiency, whether caused by CeTOR mutation or CeTOR RNAi [15,71], pointing to the likelihood that Raptor is central to all actions of TOR. Another emerging chapter in the mTOR regulation of the p70 S6K is the role of the TSC1 and TSC2 gene products known as Hamartin and Tuberin, respectively. These two polypeptides, which occur as a heterodimer, together function as a tumor suppressor . Mutation in either of the genes encoding these two polypeptides results in the syndrome tuberous sclerosis, which is characterized by the occurrence of multiple benign tumors, or hamartomas, particularly in the central nervous system, kidney, heart, lung, and skin, with the occasional emergence of a malignancy . Deletion of the Drosophila homolog of TSC1 is the cause of the gigas mutant, characterized by organ and cellular overgrowth . Overexpression in Drosophila of TSC1 and TSC2 together, but neither one singly, reduces cell size and cell proliferation [75,76] and is capable of suppressing the cellular overgrowth seen with deletion of DmPTEN or with overexpression of DmPKB [75-77]; reciprocally, loss-of-function mutations in TSC cause an increase in cell size [75,77] and can compensate for the failure of cell growth caused by hypomorphic mutations in Drosophila InsR or PI-3K but not the growth failure resulting from loss of function for Dm S6K . Bialleic deletion of murine TSC1 results in the constitutive activation of p70 S6 kinase in serum-deprived mouse embryonic fibroblasts (MEFs), without activation of MAPK, whereas the serum-induced activation of PKB (but not MAPK) is greatly diminished . TSC2 is phosphorylated in vitro and in vivo by protein kinase B (PKB), and mutation of these PKB phosphorylation sites to Ala greatly increases the inhibitory potency of recombinant TSC2 on coexpressed p70 S6K . Thus, the TSC1/TSC2 complex appears to function as a negative regulatory element in mTOR signaling to p70 S6K; the role of the TSC complex in the regulation of PKB function (if any) is yet unclear. TSC inhibition of p70 S6K is reduced through an insulin/PI-3K stimulated, PKB catalyzed-TSC2 phosphorylation. Interestingly, homologs of either TSC1 or TSC2 are not identifiable in the C. elegans genome, a species in which the PI-3K and TOR pathways show no evident cross-regulation. TSC2 thus appears to be a major locus at which the PI-3K/PKB pathway positively regulates the output of mTOR, at least toward the p70S6K. Despite the well-documented ability of mTOR to directly phosphorylate in vitro 4E-BP and p70 S6K at functionally relevant, rapamycin-sensitive sites, a considerable body of indirect evidence, derived from studies of the regulation of S6K1, indicates that the major pathway of mTOR regulation of the p70 S6K in vivo is indirect, through the negative regulation of a p70 S6K phosphatase, rather than by direct mTOR-catalyzed phosphorylation of p70 S6K . 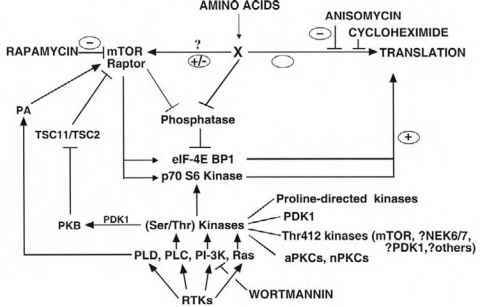 The p70 S6 kinase is activated by a complex multisite phosphorylation, regulated jointly by the type 1 PtdIns(3')OH kinase and mTOR. Activation is initiated by the phosphorylation of a cluster of Ser/Thr-Pro sites situated in a pseudosubstrate, autoinhibitory domain in the p70 S6 kinase noncatalytic carboxy-terminal tail. Although not activating per se, these phosphorylations, which can be catalyzed by a variety of proline-directed kinases as well as mTOR, enable the displacement of the tail from the centrally located catalytic domain, allowing access to the activating kinases. Activation is achieved by the phosphorylation of Thr252 [81,82], on the activation loop, and Thr412 , situated in a hydrophobic motif (FXXFTY) immediately carboxy-terminal to the canonical catalytic domain; although phosphorylation at either site gives some activation, the concomitant phosphory-lation at both sites generates a strong positively cooperative activation of catalytic function . The phosphorylation of Thr252 is catalyzed by the PtdIns(3,4,5)P3-dependent kinase 1 (PDK1), although in a PtdIns(3,4,5)P3-independent manner, at least in vitro [81,82], The identity of the kinase acting at Thr412 remains uncertain; mTOR itself can directly catalyze this reaction in vitro [68,69], as can PDK1 (although at < 5% the rate of Thr252 ). ES cells lacking both alleles encoding PDK1 show no IGF-1-stimulated phosphorylation of either Thr252 or Thr412 . Other elements that participate in p70 S6 kinase activation, although their roles are less well defined, include the atypical PKCs (X or Z) and Cdc42-GTP . The p70 S6 kinase contains near its amino terminus a short (18 residues in S6K1) segment containing only acidic and hydrophobic amino acids. Deletion of this noncatalytic segment, when combined with deletion of the carboxy terminal noncatalytic tail, results in a mutant (p70A2-46/ACT104) that, like the wild type, has a low basal activity and is strongly activated in vivo by insulin and mitogens in a PI3-K-dependent manner; activation is accompanied by increased phosphoryla-tion at the (remaining) p70 S6K sites critical to activation (i.e., Thr 252 in the activation loop and Thr 412 in the hydrophobic motif). In the wild-type p70 S6K, phosphoryla-tion at Thr 412 is most sensitive to inhibition of PI3K (by wortmannin) or mTOR (by rapamycin) [83,86]. The p70 S6K 2-46A/ACT104 mutant remains fully sensitive to wortmannin, which results in dephosphorylation at Thr 412 and inac-tivation [86,87]. In contrast, the insulin/mitogen stimulated phosphorylation at Thr 412 and activation of the p70 A2-46/ACT104 mutant is entirely resistant to concentrations of rapamycin that far exceed those necessary to dephosphorylate Thr412 and inhibit the wild-type p70 S6K in vivo and that (in complex with FKBP12) inhibit the mTOR kinase activity assayed in vitro [86,87]. The unimpaired mitogen/PI-3K responsive activation of the A2-46/ACT104 variant in the presence of rapamycin establishes that mTOR kinase activity is not necessary for the insulin-mitogen activation by p70 S6K. Rather, it appears that the primary function of mTOR in p70 S6K regulation is to restrain a p70-S6K-inactivating element, most likely a p70 S6K phosphatase. Direct evidence in support of this idea is scant; however, Peterson et al,  have reported that the PP2A catalytic subunit can be coprecipitated with wild-type p70 S6K but not with the p70 S6K A2-46/ ACT104 mutant, suggesting that the p70 S6K amino-terminal segment necessary for rapamycin sensitivity may serve as a binding site for the phosphatase or a phosphatase-associated regulatory protein. The function of this motif however is likely to be more complex, inasmuch as 4E-BP contains a motif similar in sequence to that in the p70 S6K amino terminus, and mutation of the motif in 4E-BP suppresses its insulin-stimulated 4E-BP phosphorylation . In addition, overexpression of wild-type p70 S6K interferes with insulin-stimulated hyperphosphorylation of 4E-BP [89,90], but mutation or deletion of the p70 S6K amino-terminal rapamycin sensitivity segment abolishes the ability of coexpressed p70 S6K to suppress 4E-BP phosphorylation . Thus, it appears that this motif is binding to some component critical for mTOR signaling; however, whether this is the mTOR polypeptide, a TOR scaffold protein, or a TOR-regulated phosphatase remains to be determined. The idea that mTOR signaling is mediated in part through the modulation of protein phosphatase activity is entirely consistent with pathways elucidated in S. cerevisiae, wherein a mutation in the phosphatase regulatory protein TAP42 renders yeast significantly rapamycin resistant . TAP42 associates with a small fraction of the yeast PP2A and SIT4 (homologous to mammalian PP6) phosphatase catalytic subunits and somehow restrains their activity toward specific substrates . The TIP41 protein in turn negatively regulates TAP42 and TOR phosphorylates both. Nutrient deprivation or rapamycin inhibition of TOR causes dephosphorylation of TIP41, increasing its binding to TAP42, which releases the SIT4 phosphatase into an active state . This results in the dephosphorylation of a number of mTOR target proteins (e.g., the cytoplasmic scaffold protein Ure2p, the transcription factor GLN3, or the protein [Ser/Thr] kinase NPR ). The mammalian homolog of TAP42, a4 , binds to the PP2A, PP4, and PP6 phosphatase catalytic subunits [96-99]; however, the rapamycin sensitivity of these complexes is disputed, and their role in the rapamycin-induced dephosphorylation of p70 S6K, 4E-BP, or other mTOR targets is unknown. In addition to its positive regulatory input into the p70 S6K, mTOR also controls the activity of certain isoforms of PKC in an analogous manner. Thus, phosphorylation of the novel PKC isoforms 5 and e at sites near their carboxy terminus that are situated in hydrophobic motifs homologous to that surrounding S6K1 (Thr412) are also regulated in a serum-stimulated, rapamycin-sensitive manner [100,101]. Phosphorylation at these nPKC sites augments activity dramatically and is one step in a complex regulatory mechanism involving PDK1, an atypical PKC isoform and the ligand diacylglycerol . As with the p70 S6K, the ability of rapamycin to cause dephosphorylation of the nPKCs is thought to be mediated by activation of a protein phos-phatase. PKC5 can be coprecipitated with mTOR (as well as the DNA PK, another PIK-related kinase) and inactive variants of PKC5 can partially suppress serum-stimulated 4E-BP phosphorylation .